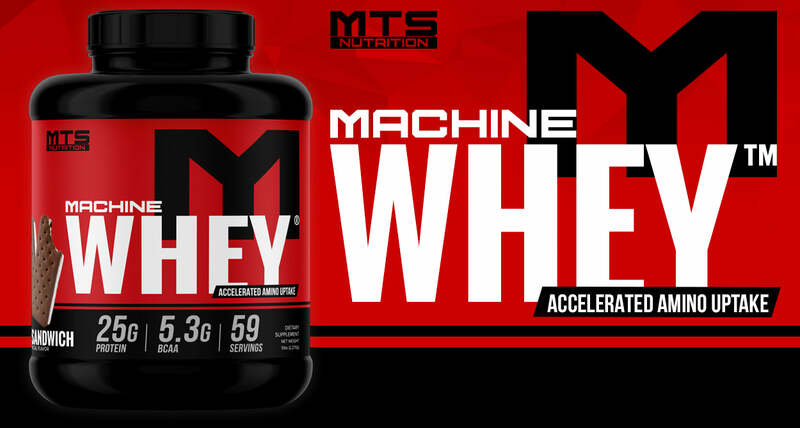 "The goal with MTS Nutrition Machine Whey™ is to provide a high-quality whey protein blend that provides the benefits of a full-spectrum Whey Protein Concentrate, and the lower carbohydrate and fat of Whey Protein Isolate to fit into any diet and training program. To be consistent with any diet and nutrition program, you need to enjoy what you eat. So not only do we have the best quality protein on the market, it also blows every other protein away with flavors that taste like ice cream shakes! Don’t believe me, buy it and try it. We offer a 100% Money Back Guarantee if you aren’t completely satisfied." MACHINE WHEY uses a VERY HIGH PERCENTAGE (80%) Whey Protein! Protein is essential for muscle repair and growth. In order to get in sufficient amounts of protein each day, athletes frequently opt for protein powder as a quick, tasty, and affordable way to get in their daily protein. In fact, whey protein powder is quite often the very first supplement athletes purchase in their pursuit of improved recovery and increased muscle growth. The reason whey protein is so beneficial for hard-training athletes is that it is a complete protein, containing all the essential amino acids. It’s also very high in branched-chain amino acids (BCAAs), the trio of amino acids responsible for driving muscle protein synthesis. Whey accounts for 20% of the protein in milk (the other 80% is casein). Whey Protein Isolate (WPI) is simply a more refined form of whey protein concentrate. Additional carbs and fats have been removed from the whey to yield a product that is ultra-high in protein (>90%) and extremely low in carbs, lactose, and fats, making isolates the ideal option for individuals with lactose digestibility issues. By employing the ideal mix of whey concentrate and isolate, Machine Whey creates a protein powder that is both extremely gratifying in taste and texture while at the same time being high in protein and lower in carbs and fats that concentrate-only powders. Whey Protein is essential for athletes looking to increase lean mass and lose fat. Athletes need more protein in their diet, and as stated by the International Society of Sport Nutrition, more than twice the recommended daily allowance. Whey protein contains ALL essential amino acids, making it a complete protein and is also very high in Branch Chain Amino Acids (BCAA). The BCAA's Leucine, Valine and Isoleucine have been shown in studies to help people build lean mass and burn fat. Whey protein helps you maintain healthy immune system by increasing the levels of glutathione in the body. Glutathione is an anti-oxidant required for a healthy immune system. Exercise and resistance training may reduce glutathione levels. Thus, whey protein might also keep you healthy! For maximum results, consume Whey Protein pre and post workout and anytime you need extra protein in your diet. Whey protein can replace protein in your meals. Marc "The Machine" Lobliner invented Sludge for all to enjoy. A simple mixture of Machine Whey, Blueberries and water! Simply search the keyword "Machine Whey Sludge" on YouTube and find out how YOU can make your own Sludge! Who Can Take Whey Protein? Anyone looking to increase their protein intake or potentially improve body composition through the addition of Whey Protein. For healthy individuals, there are few when consumed as recommended but please consult with your doctor prior to using any and all dietary supplements. 1. McDonough FE, Hargrove RE, Mattingly WA, Posati LP, Alford JA. Composition and Properties of Whey Protein Concentrates from Ultrafiltration. J Dairy Sci. 2018;57(12):1438-1443. doi:10.3168/jds.S0022-0302(74)85086-1. 2. Bounous G, Batist G, Gold P. Immunoenhancing property of dietary whey protein in mice: role of glutathione. Clin Invest Med. 1989;12(3):154-161. 3. Pasiakos SM, McLellan TM, Lieberman HR. The effects of protein supplements on muscle mass, strength, and aerobic and anaerobic power in healthy adults: a systematic review. Sports Med. 2015;45(1):111-131. doi:10.1007/s40279-014-0242-2. 4. Frestedt JL, Zenk JL, Kuskowski MA, Ward LS, Bastian ED. A whey-protein supplement increases fat loss and spares lean muscle in obese subjects: a randomized human clinical study. Nutrition & Metabolism. 2008;5:8. doi:10.1186/1743-7075-5-8.